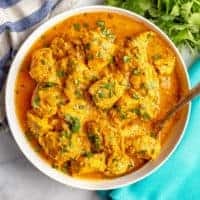 Healthy butter chicken is a delicious Indian dish with tender chicken pieces swimming in an amazing, creamy tomato curry sauce that’s packed with spices and flavor. This easy recipe is ready in 30 minutes! J had a soccer game (and scored three goals), M had her first sleepover and also her horseback riding lessons. We had a friend over for a play date and my husband and I had a dinner and symphony date night out on the town. And that was all just on Friday and Saturday! So while I’m a bit wiped out, I’m also feeling revived and refreshed and ready to tackle the week ahead. And I’m so excited to share today’s new recipe with you at last! 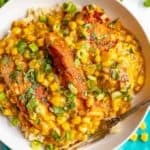 You guys know I love my curry dishes, especially when they’re quick, easy and on the healthier side. 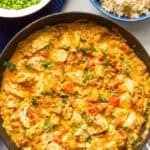 I’ve shared my quick chicken curry, 20-minute coconut chicken curry and my quick and easy vegetarian curry. 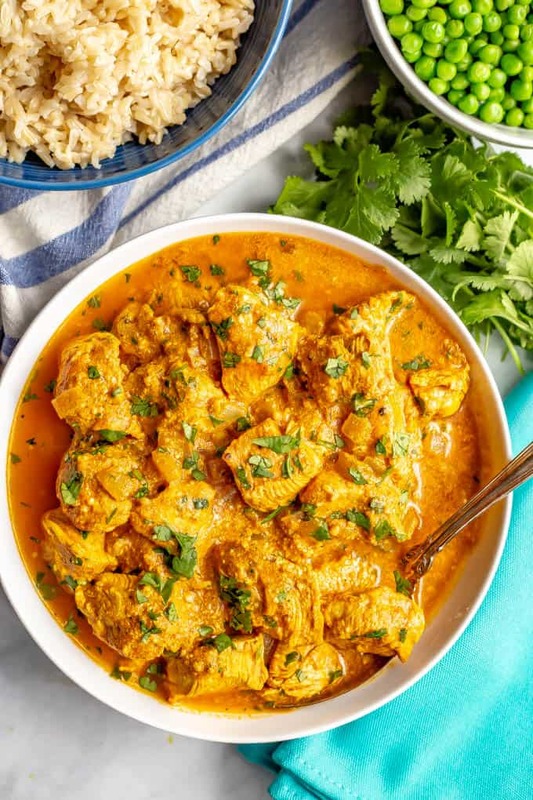 Today, I’m so excited to share one of my favorite easy Indian recipes: healthy butter chicken! I’m so in love with this dish. 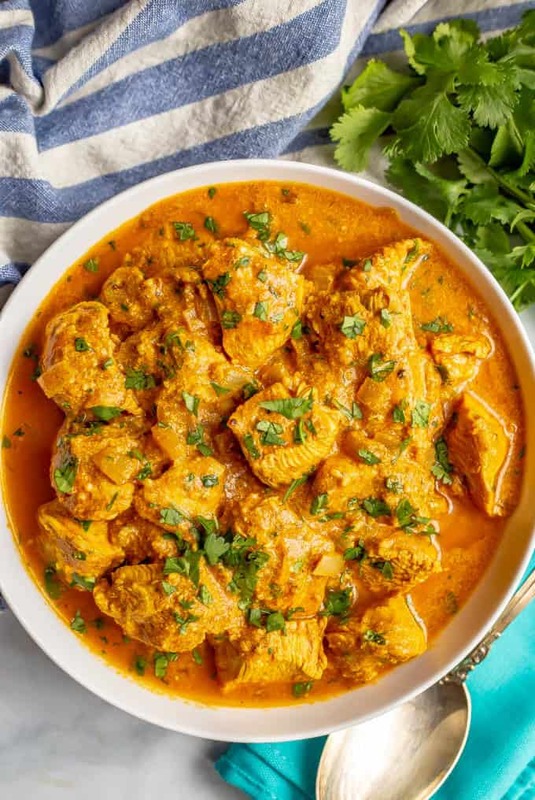 The aroma, the spices, the sauce, the simmering deliciousness that bubbles away and has you drooling as you wait to dive in. 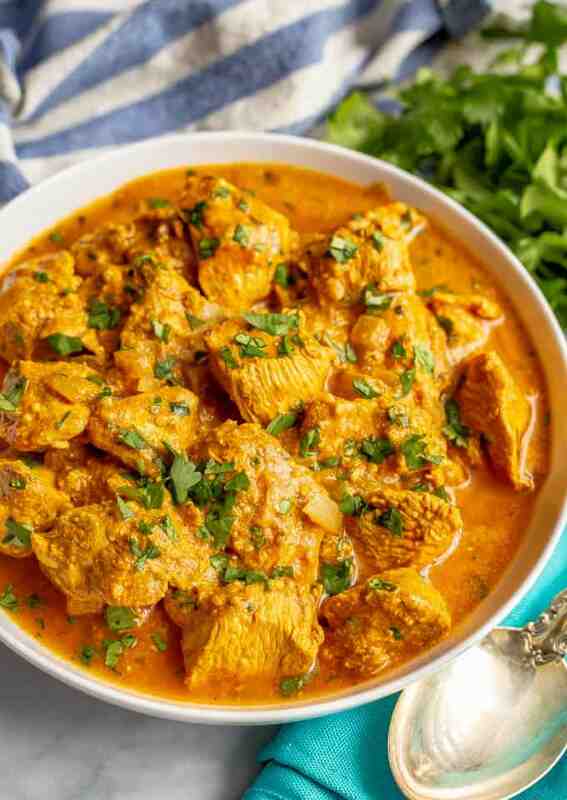 Butter chicken is an Indian dish of chicken in a mildly spiced tomato sauce. 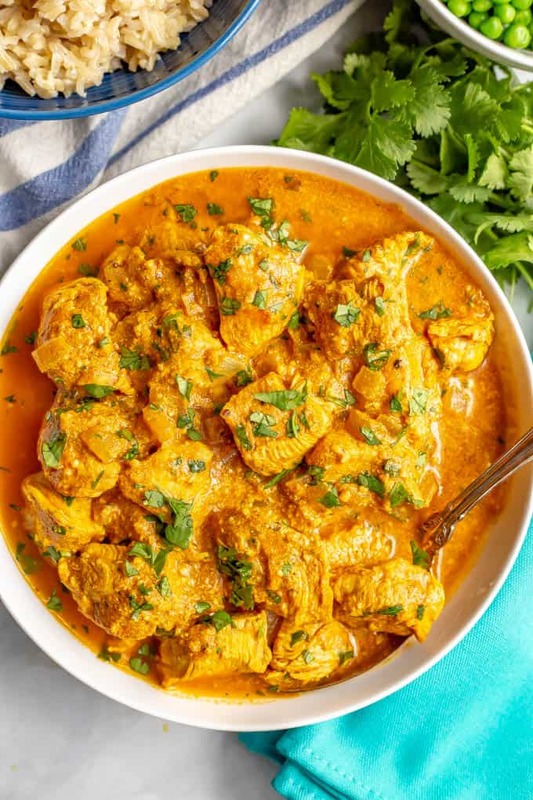 It’s also called murgh makhani or chicken makhani. 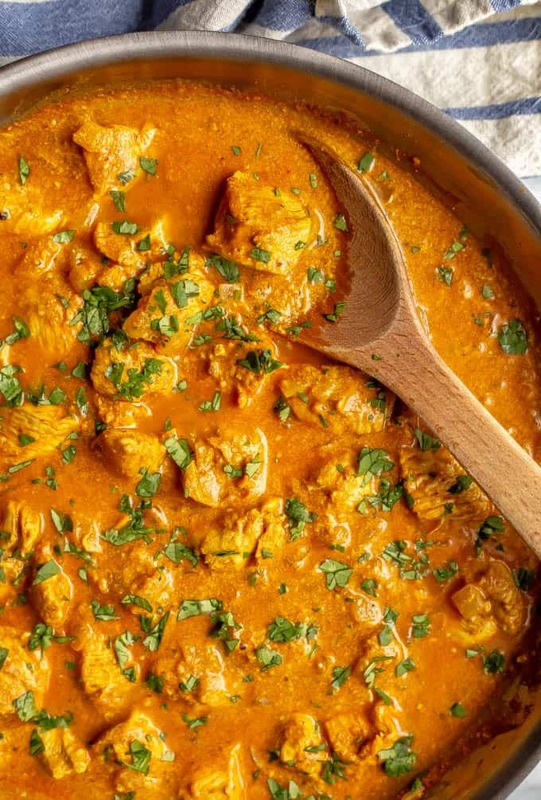 Funny enough, it’s not uncommon to not actually use butter in the sauce for this butter chicken recipe. And it’s not needed. My version uses no butter, is made without any cream and you don’t miss it one bit. 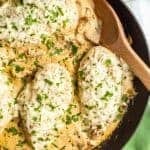 It’s got such a rich, creamy tomato sauce that’s begging to be spooned greedily over all of the chicken and rice on your plate. In fact, this is slightly embarrassing, but I have actually put the sauce in a bowl and spooned it up all by itself. See, I was doing my vegetarian month and was making this dinner for the rest of my family. So I couldn’t have the chicken. But that didn’t stop me from missing out on the sauce! And once you smell it and taste it, you’ll know just what I mean! I think this tastes best when you let the chicken marinate for at least 45 minutes to an hour. If you’ve only got 30 minutes, that’s good too. If you don’t have time to marinate it at all, just mix it all together first and then start cooking. It’ll still taste great! 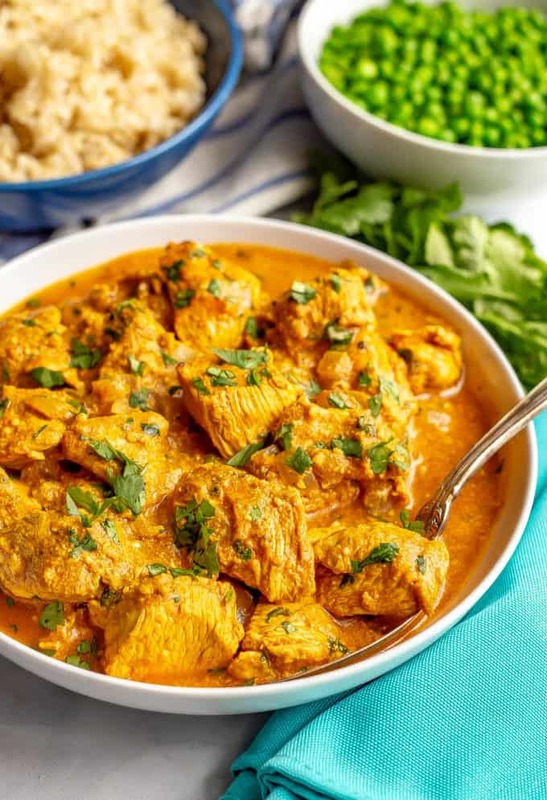 Garam masala is a tasty blend of ground spices often used in Indian cooking. If you don’t have any, you can substitute curry powder. Like it spicy? 🌶 You can increase the amount of cayenne up to 1/2 teaspoon. Oh, and I never have an issue with curdling, but milk and yogurt can curdle if it heats too quickly, or if it comes to a boil. 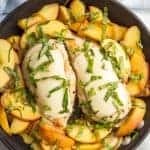 You may want to lower your heat or briefly remove the pan from the stove when you add the Greek yogurt in this recipe to help prevent curdling. As for serving, we love this over steamed brown or basmati rice. 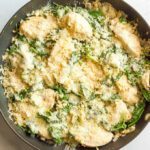 You could also use cauliflower rice for a low-carb option. I love this with peas and sometimes mix them right in with the chicken and sauce to warm them and get them all coated in the sauce. So yummy! You could also use steamed broccoli or asparagus as a veggie side to round out this meal. Last question to tackle, in case you have leftovers. 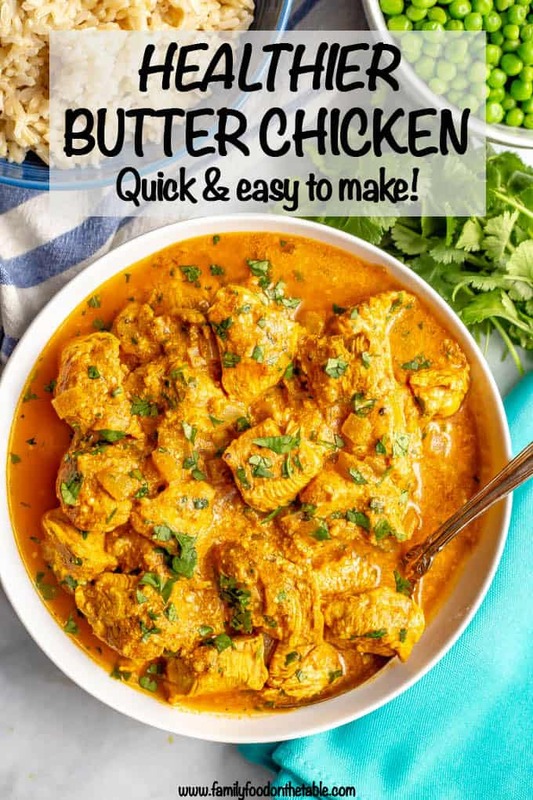 Can you freeze butter chicken? Yes. I’m on team you can freeze most things, but this does freeze well. You can freeze it for up to 5-6 months in a freezer-safe ziptop bag or container. Also, I think the sauce helps keep the chicken from drying out while reheating. You can reheat it in a pan on the stove or in the microwave. I hope you give this a try soon – I think you’ll fall in love! P.S. 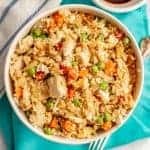 Check out all of my other 30-minute chicken recipes for more quick and easy dinner inspiration. 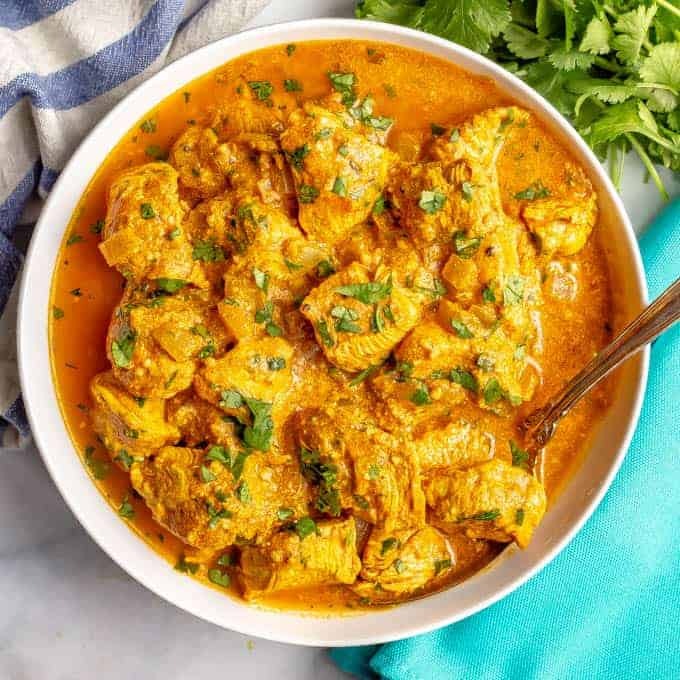 Healthy butter chicken is a delicious Indian dish with tender chicken pieces swimming in an amazing, creamy tomato curry sauce! Place the cut pieces of chicken in a bowl or tiptop plastic bag. Combine all of the marinate ingredients in a bowl and stir well. (It will be very thick.) Pour the marinate ingredients over the chicken and stir to coat all of the chicken. Let marinate for at least 30 minutes and up to 8 hours (see notes). Heat a large skillet over medium-high heat. Add canola oil. Add onion and cook for 2-3 minutes, until softened. Add garlic and cook for an additional minute. Add the marinated chicken (along with all of the marinade) to the pan. Sprinkle with brown sugar and cook for 2-3 minutes. Add the yogurt and water, reduce the heat to medium or medium-low, enough to maintain a steady simmer. Let cook for 8-10 minutes, until the chicken is cooked through and sauce is thickened. Season to taste with salt and pepper (it may not need any). Serve the chicken hot with extra sauce spooned over top. Like it spicy? You can increase the amount of cayenne up to 1/2 teaspoon. I never have an issue with curdling but milk and yogurt can curdle if they come to a boil or heat too quickly. You may want to remove your pan from the heat when you add the yogurt in this recipe to help prevent curdling.